The AVSC A team was in the West Midlands Premier Division Final, at Coventry against: Coventry, Boldmere, Leicester Penguins, City of Derby and Redditch. This was always going to be a tough gala with some very big clubs and the best result would be to upset the status quo with a few surprises. Memorable wins came from Emily Ford(2) and David Murphy(1) winning by some margin and overall the gala turned into chasing points to catch Leicester for 4th place. Being a Long Course 50m pool, it was quite a change from racing short course, especially for the younger squad members who managed really well, and those who had to swim-up. The 6x50m relays at the end were crucial, pipping Leicester in each, and we were oh so close within 1 point to be 5th on the night. BUT - overall, adding the League Points from Rounds 1 & 2, AVSC ended 4th overall in the Premier League of 24 teams - a great result. Coventry won the meet on the night, but Boldmere's previous scoring meant they will go to the A Final and Coventry to the B, representing the Region. A hard fought battle and a few people missing which meant AVSC could not enter all relays meant we came 6th on the night. There were a lot of great racing from AVSC and even with not entering all events we were just pipped to the 5th place position. Well done and thank you to all those who took part in Arena League this season. A real team result from this competition - every point counting to pip Worcester (after losing out last year by just a few points) and get 2nd place in the closing part of the programme. Lots of 3rd and 4th places throughout, against seriously tough competition. Other swims came up against really fast (and sometime much larger) competitors (mainly from Boldmere and Worcs), but pulled in great times - you'll have to wait for the results to see any PBs. The AVSC B Team travelled to Leighton Buzzard for the second round match full of high spirits and determination. We were competing against 5 other teams : Aylesbury & District, Camphill Edwardians A, Linsdale Crusaders, Leighton Buzzard and Pershore, all quite local clubs and Leighton Buzzard and Linsdale Crusaders were the favourites. True to form the Arena league had chosen a swimming pool that was undergoing refurbishment which meant that there were no showers and, even more importantly, no place to get coffee for the spectators and as usual the normal chaos ensued as 6 teams all got changed at the same time. We staked out a prime spot poolside and AVSC tattoos and green war paint was applied. 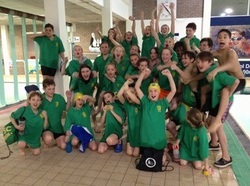 Once swimming got underway, it was clear that Leighton Buzzard and Linsdale were the two teams to beat but we had racked up 3 2nd places in the opening 10 events and were a team in contention. At the half way stage we were in second place helped by some strong individual swims across all ages, with a number of PBs being beaten. The second half of the programme was tougher for top results but every swimmer battled to get as many points as possible and with a late flurry in the relays, AVSC finished up a very creditable 3rd with Linsdale and Leighton Buzzard tied on points for 1st place (Leighton Buzzard were declared winners because of more first places). Whilst we did not get any 1st places, we finished in 2nd or 3rd place in over 50% of the races. Thanks to all the swimmers, the parents and coaches for turning out and giving their all on a miserable Saturday evening-roll on Round 3! Six AVSC swimmers were selected to part of a 26 strong team representing the best of swimmers in the County of Oxfordshire and North Bucks. The team, coming from 6 clubs in the County, travelled to Sheffield to take part in the British Gas National County Team Championships held in the prestigious Ponds Forge. 39 Counties were competing at this exciting annual event. 20 teams in Div 1 and 19 teams in Div 2 created a great day of competition and healthy rivalry. Deck hosts for the day were Jo Jackson (triple Olympian) and Ross Davenport (double Commonwealth gold medallist). 338 points that launched Oxon and North Bucks into 8th place after promotion from Division 2 just back in 2011. Showing its strength in depth, AVSC was able to field a 'B' team for the first time ever. This team came out strong, achieving 3rd place in its first ever outing, only 5 points off of second. Well done teams! Congratulations to Niall O'Leary and David Murphy who have been identified to attend an England Performance Profiling and Development Day. This day will take place at Surrey Sports Park on Sunday 6th October 2013 . The day will comprise of pool and land based testing/profiling and swimmer education opportunities. What a fantastic opportunity for the boys and the recognition they deserve. Rhian Casey 100 freeNienke Lijzenga 200IM. Renee Truggelmann 100 Breaste to edit. Congratulations to the six AVSC swimmers who were selected to be a part of the Oxfordshire and North Bucks County in the National County Team Championships to take place at Ponds Forge, Sheffield on Sunday 21 October. Caitlin Wheatley, David Murphy, Ellie Nutt, Michael Esnouf, Niall O'Leary and Shannon Motha Will join the ONB team to compete against 38 Counties from the UK. There is always a great atmosphere and plenty of team spirit! 5 Youth swimmers from AVSC competed at the British Gas ASA Youth (15-18yrs) National Championships in Ponds Forge, Sheffield, 30th July - 4th August, 2013.Michael Esnouf (17) Harry James (17), Alex Murphy (18), Niall O'Leary (16) and Caitlin Wheatley (16) represented AVSC at this major end of season Championship. Caitlin Wheatley (16) posted a Personal best time for the 200 fly (2.20.36) bettering her own Junior County record. She also competed in the 100 fly. Harry James (17) gained a Pb in the 200 breast (2.25.68) as well as competing in the 100 breast. Club mate Michael Esnouf (17) competed in both the 100 and 200 breast. History was made today (27 July 2013) when 14 year old David Murphy got AVSC's first medal at the National Championships. David secured a silver medal in the 100 breast stroke with a time of 1.08.04. Four Appleton School girls who swim with AVSC, Isabella Boyce Parr, Emily Ford, Zoe Lovibond and Leonie Watson (Pictured with coach Amanda Ford) took double gold at the ESSA Primary School Championships and were crowned National Small Schools Champions 2013 at Ponds Forge, Sheffield on Saturday. 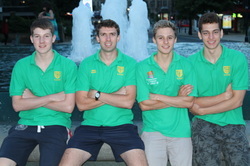 Having won both their heats, they completed the 4x25 medley relay in 1.04.66 and the 4x25 freestyle relay in 58.16. The girls were competing in the small schools group but their freestyle time was the fastest of the their event, beating both the large schools boys and girls teams.